September is traditionally dry in our part of S. California, with gardens favoring the browns, pale golds and rusty oranges. While these muted hues are lovely, we sometime crave a bit of green this time of year. An easy way to provide it is to create a ‘wetland in a pot’ (for more see: http://mother-natures-backyard.blogspot.com/2013/05/guilt-free-gardening-grow-wetland-in-pot.html ). As California gardens become more drought-tolerant, the concept of green garden oases is gaining popularity. Middle Eastern and Mediterranean gardeners have long understood the stresses of heat and drought. Their gardens contain restful retreats with shade, green plants and water features. Evergreen plants – and particularly those associated with cool wetlands – are increasingly important during times of drought. We should learn to use them – albeit sparingly - in our own gardens. 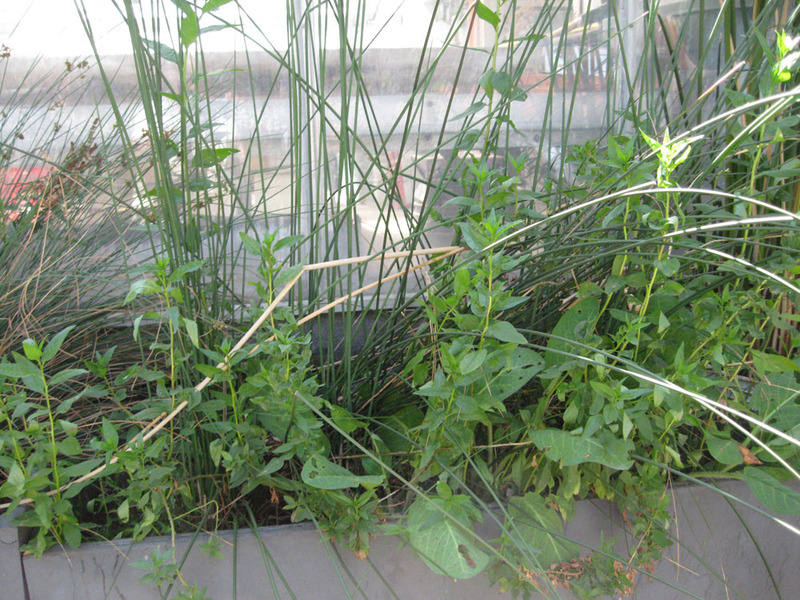 ‘Wetlands in Pots’ allow us to grow local wetland plants on a small scale. The native plants provide habitat for insects and birds, as well as promote our own physical and emotional well-being. Plants can range from small grass-like sedges to larger rushes, cattails and unusual wetland perennials. One of the most charming and unique is our Plant of the Month, Yerba mansa (Anemopsis californica). 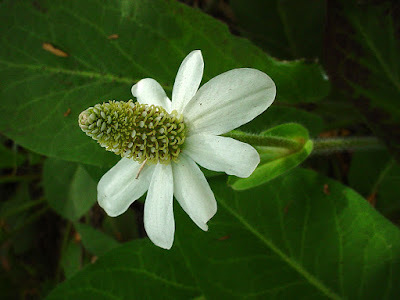 With a little summer water, the Yerba mansa in our Garden of Health is green and just finishing blooming. 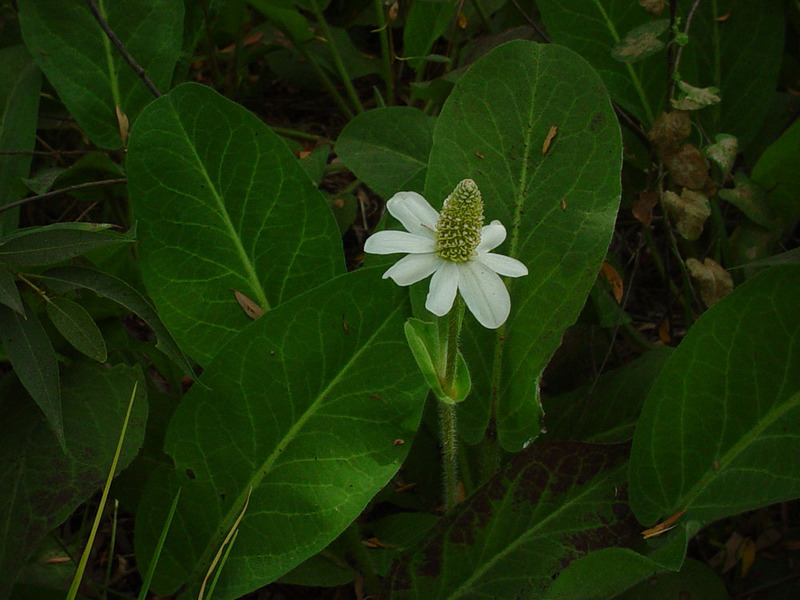 Yerba mansa is native to much of southwestern United Sates and northwestern Mexico. In California, it can be found as far north as the San Francisco Bay and Sacramento Valley. In Southern California, it once grew from the ocean to the lower mountain flanks (to about 5000 ft/2000 m.) in plant communities as varied as the Coastal Salt- and Brackish Marshes to the Yellow Pine Forest. It formerly inhabited the local brackish wetlands of Redondo Beach, San Pedro/Long Beach, the Ballona and Compton Creeks and the southern Channel Islands. What all Yerba mansa sites have in common is moist ground – at least seasonally. 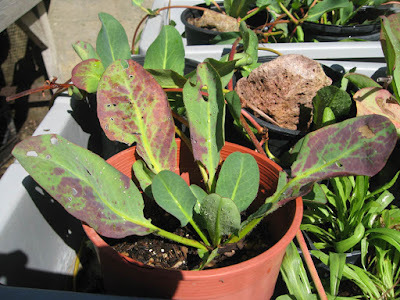 Yerba mansa belongs to an unusual plant family. The family Saururaceae (the Lizard-tail family) has a small number of genera (four) and species (seven) that are native to Asia and North America. Members of this family like moist places and are often important medicinal plants. Yerba mansa is the only representative native to California. Yerba mansa is an herbaceous perennial ground cover. While growing only 12-18 inches tall, it can spread to 4-6+ feet in a favorable site. Vegetative propagation (spreading by runners or underground stems) is an important method of conquering new territory for many wetland plants. It’s one of the reasons that Salty susan (Jaumea carnosa), Lippia/Fog fruit (Phyla lanceolata) and Yerba mansa make such good ground covers in moist places. They will literally cover the bare ground if conditions are right. It’s also a reason to grow such plants in containers (if containment is an issue). 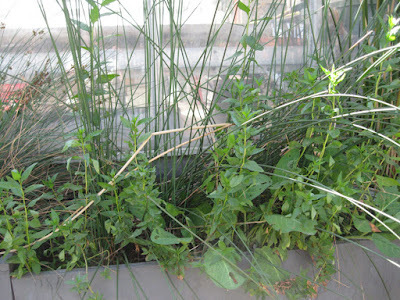 A Yerba mansa plant increases in size via thick stolons (above-ground runners; like a strawberry plant) that produce new plantlets (see above). The runners appear in summer; they root at nodes, and new plantlets appear soon after. In our greenhouse at CSU Dominguez Hills, new plantlets are establishing nicely this time of year (see below). 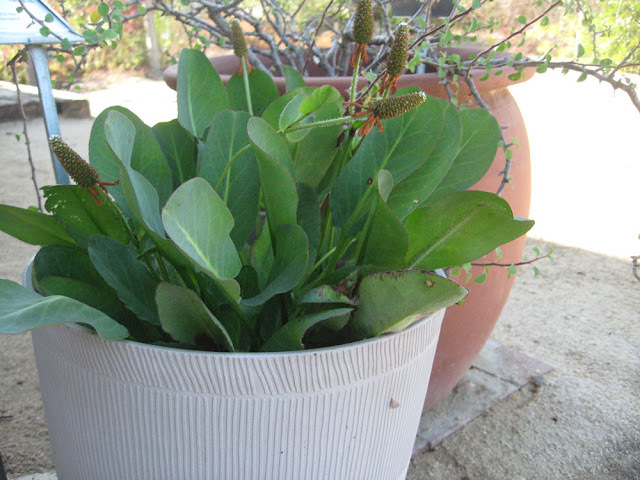 If you grow Yerba mansa in a container, select a few runners for reproduction each year. 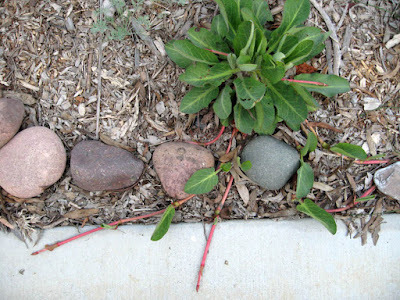 Just let them root on bare soil – you don’t need to do much other than ensure that stolons remain in contact with the soil. 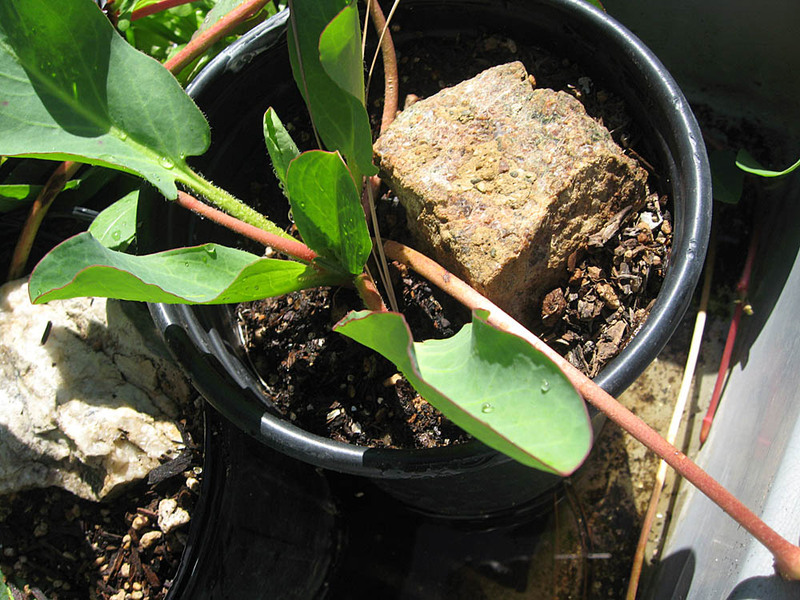 If sharing Yerba mansa with friends, let the stolons root in new pots. Once the plantlets are well established, cut the attachment to the parent plant, tidy up the pot and your garden gift is ready to go. The leaves of Anemopsis californica are 2-8 inches long (5-20 cm), simple, alternate, medium gray- to blue-green and fleshy (succulent). The largest leaves are in a basal rosette. The leaves, which are upright but low to the ground, are smooth, somewhat rubbery and cool to the touch. 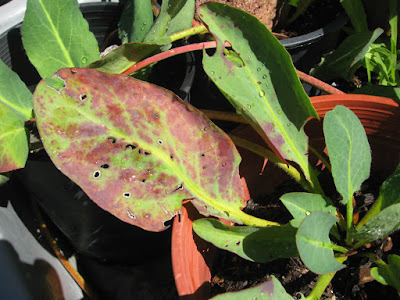 There are a few soft hairs on the leaf margins and underside of the leaves, at least in younger leaves. In late summer (or when the ground dries out) the leaves turn the most amazing colors, with blotches of red, purple and black amongst the fading green. The leaves in the photo above are just beginning to change color. The leaf colors add a unique accent to the fall garden. In late fall or winter, the plants often become entirely dormant, dying back to their roots. New leaves appear with the warm weather of spring. Yerba mansa’s flowers are consistent with their Saururaceae heritage. In general, this family’s flowers reflect plants of ancient times; that’s part of what makes them so enchanting. 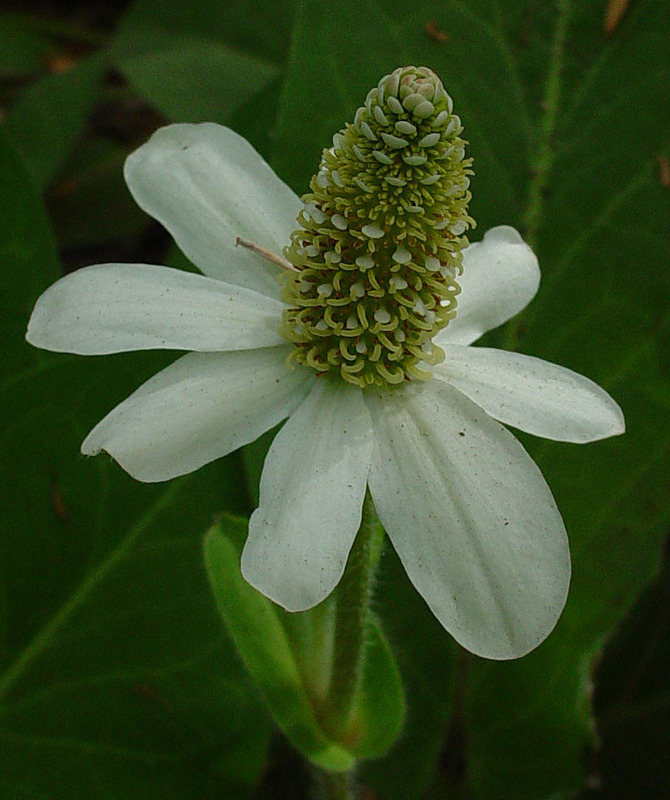 In Anemopsis californica and others, the small modified flowers grow closely packed along a stout conical spike. The large white ‘petals’ at the base of the spike are not petals at all, but highly customized bracts (bracts are modified leaves found at the base of some flowers). Smaller white bracts are also seen along the spike, at the base of each tiny flower (see below). The stamens (pollen-producing male parts) are clearly visible in the close-up photo. The anthers are long and curved; the pollen is yellow (you can even see a dusting of pollen on the basal bracts if you look closely). Each flower has three stamens; each stamen is split, forming six ‘anthers’ per flower. The female parts of each flower are largely hidden. For more details on the anatomy and development of Yerba mansa flowers see: http://www.jstor.org/stable/2443565?seq=1#page_scan_tab_contents. The brown dry seed capsules, interesting in their own right, remain on the plants for several months. One of the most striking attributes of Yerba mansa is its aroma. All parts of the plants are somewhat aromatic, but the leaves and particularly the roots are the most pungent. Like many California plant aromas, this scent is difficult to describe: it’s spicy, somewhat gingery, has over-tones of eucalyptus and camphor, etc. In short, the scent is almost impossible to describe, but so distinctive that once you know it, you recognize it instantly. When plants are not in bloom, the aroma is often the first thing you notice when approaching a Yerba mansa plant. Yerba mansa is quite easy to grow in containers or in the ground. It likes full sun to part-shade, making it useful in many gardens. It’s not at all picky about soil pH (range: 5.0 to 9.0) or soil type. It does prefer moist soils, and will need regular summer water to keep it green in summer. We generally let our wetland plants slowly dry out beginning in September (just water less frequently) to mimic natural conditions. Yerba mansa is best planted in parts of the garden that receive regular water (Water Zone 3). Many gardeners plant them as a ground cover around (even in) shallow ponds, near fountains, and in rain gardens and other naturally moist areas. They are perfectly suited to container life, and make interesting specimen plants in containers and bog gardens. Some gardeners plant them as groundcovers under trees that require regular water. They are also used to improve the soils in reclamation projects (plants remove salts and decrease soil pH). The secrets to managing Yerba mansa are few: 1) provide damp soils through summer; 2) taper off water in fall; 3) cut back (or even mow) dead plants in late fall or early winter. Wait until plants have died back before pruning – it won’t harm the plants. You can leave the removed dead leaves as mulch or not (they decrease the soil pH and add organic material). Traditional practice involved the periodic burning of Yerba santa patches to retain vitality; pruning achieves the same end. You don’t need to prune every year, although many gardeners do for aesthetics. But every 2-3 years, they need to be sheared. 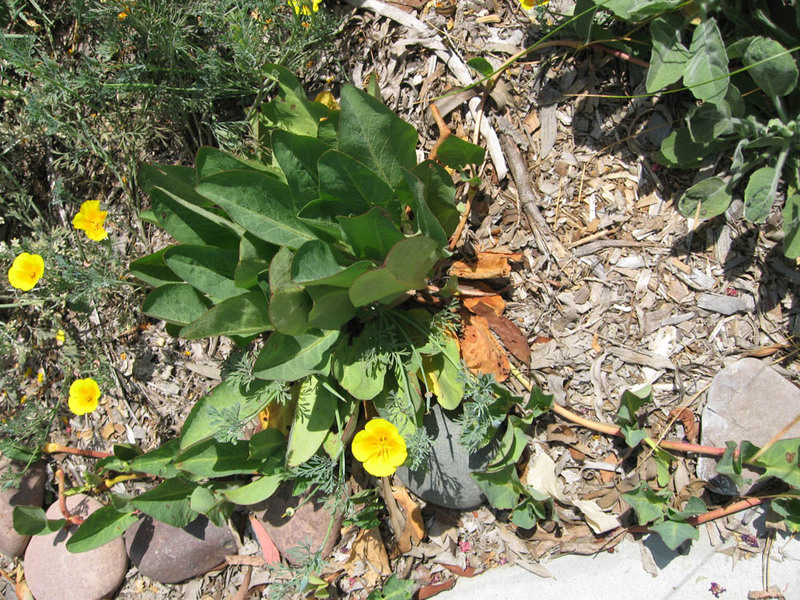 Yerba mansa is clearly an unusual California native plant. So, why consider including it in your garden? In addition to its interest and beauty, Yerba mansa provides habitat for birds (seeds) and small creatures (Pacific chorus frogs and lizards and salamanders come to mind). The flowers bloom in summer, when white flowers are a treat. And, of course, the plants are great for filling in areas around a rain garden. Plant it with moisture-lovers like Juncus, Sweetscent (Pluchea odorata) and other wetland plants. The fragrance provides a clean, spicy note to the scented garden and the dried leaves add a special zing to potpourri mixes (see: http://mother-natures-backyard.blogspot.com/2013/11/garden-crafts-making-potpourri-from.html ) But you may also want to grow this plant as a medicinal. Like many aromatic plants, Anemopsis californica has a long and interesting history as a medicinal plant. In fact, Yerba mansa is an extremely important medicinal throughout its range. The name ‘Yerba mansa’ is a shortened version of the Spanish ‘Yerba del manso’ (‘herb of the peaceful Indians’), referring to the medicinal use of this plant by many native tribes. Yerba mansa has been used – and shared - as a medicinal plant, by many peoples, right up to the present. The plant produces a dizzying array of aromatic chemicals, particularly when slightly stressed (e.g., as plants become drought-stressed in late summer). The exact medicinal properties of many of these are still being discovered. Leaves are known to produce elemicin, piperitone, methyleugenol, (E)-caryophyllene, 1,8-cineole, alpha-pinene and beta-phellandrene. Roots produce methyleugenol and many other chemicals including: thymol, piperitone, isoeugenol, cymene, limonene, alpha-pinene, 1,8-cineole, myrtenol and elemicin. For more on the plant chemistry of Yerba mansa see reference 1, below. Yerba mansa is attracting increasing interest from both herbal and Western medical practitioners. Root extracts have been shown to have significant activity against gram-positive human bacterial pathogens like Staphylococcus aureus, Staphylococcus epidermidis, Streptococcus pneumoniae and Streptococcus Pyogenes . Extracts also appear to have anti-bacterial activity against a serious current ‘problem pathogen’, methicillin resistant Staphylococcus aureus (MRSA). Perhaps the key to fighting this challenging pathogen is among the many chemicals produced by Yerba mansa. As has happened so often in the past, traditional plant-based medicine suggests compounds ultimately included in the Western medical armamentarium. Recent research – and a long history of tradition use - supports the antimicrobial, antibacterial, antispasmodic, diuretic and anti-inflammatory properties of Yerba mansa. The antimicrobial properties likely explain the widespread use of leaves and roots for a range of complaints related to infectious agents. An infusion (tea) made from either leaves or roots was traditionally used as a wash for cuts, skin sores, wounds, gum problems and canker sores. A dried powder made from roots was widely used as a disinfectant powder for skin sores, ulcers and small wounds; and to treat diaper rash and athlete’s foot. Tea made from leaves or roots was also drunk as a treatment for colds, sinus problems, coughs and chest congestion as well as stomach upset, stomach ulcers and general malaise (a ‘blood medicine’). The tea’s efficacy likely was due to the antimicrobial, diuretic and anti-inflammatory chemicals. As a diuretic, Yerba mansa also relieves the body of uric acid, perhaps explaining its use in the treatment of gout and prevention of kidney stones. Methyleugenol, produced by both the leaves and roots, is an antispasmodic agent. This likely explains the use of a tea made from either roots or leaves in treating stomach and menstrual cramps; poultices made from leaves are also said to be an effective treatment for muscle cramps and spasms. 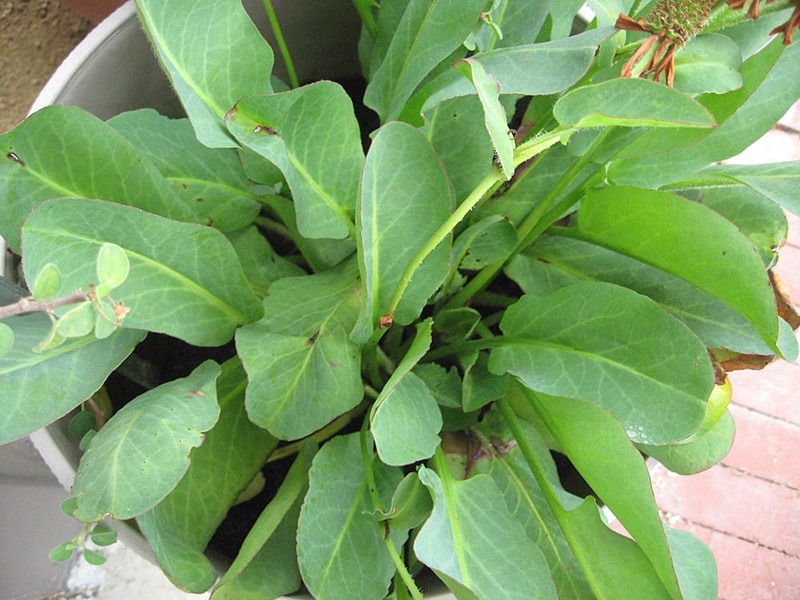 Arthritic joints were traditionally soaked in warm water infused with Yerba mansa leaves or roots. Infusions were also used as washes/baths to reduce swelling. The anti-inflammatory properties of this plant may explain these uses. Infusions were also used to ‘cool’ burns and sunburns, so there may be some analgesic components as well. Green leaves can be harvested any time. Roots were traditionally only harvested from more mature plants; the fleshy roots were harvested in the fall, when the chemical content was the highest. The roots were often dried for later use. For more on the medicinal uses of Yerba mansa, see the references below. The above information is for educational purposes only. This information has not been evaluated by the Food and Drug Administration. This information is not intended to diagnose, treat, cure, or prevent any disease. Once again, thank you for a great article. This, in bloom, is pretty special.